During April 2018, I had the opportunity to visit Alcainca and experience the art of classical dressage. Georges Malleroni is the senior instructor here and you couldn’t ask for a finer teacher. Georges has studied classical dressage under Nuno Oliveira, one of the great Portuguese Masters and you can tell instantly that he knows his stuff. The horses here are fit and obviously enjoy their work. 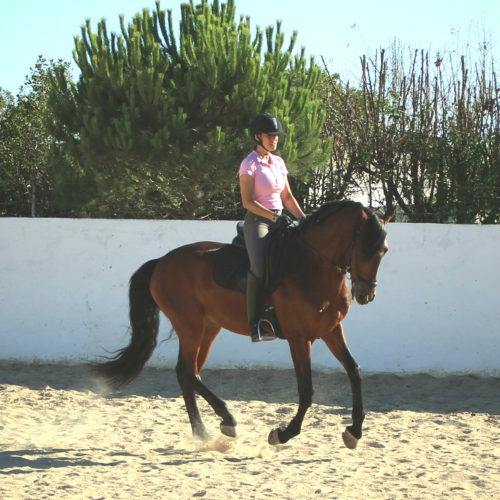 They are a mix of pure-bred and part-bred Lusitanos and are all forward and eager to please. There are horses capable of high level movements and all riders will find a perfect match. As is traditional in Portugal, the horses at Alcainca are stabled with some time turned out in small paddocks. The food at Alcainca is simple traditional Portuguese cuisine with a mixture of dishes made from local ingredients, including locally caught fish dishes, chicken in wonderful sauces and fresh fruit or crème brule for desert. During your stay you’re accommodated in simply decorated comfortable rooms which are close to the stables. Hearing the horse shuffling in their stalls and calling for their breakfast is a wonderful thing to wake up to. For those wanting to immerse themselves in classical dressage and Portuguese tradition Alcainca would be a wonderful destination to visit. If you would like to read more about my visit to Alcainca you can ready my blog here.